Los Angeles based artist Todd Williamson will open his solo exhibition "Processional" at the 58th International Venice Biennale on May 11, 2019. The Pollock Krasner Foundation, in partnership with the MAK Center for Art & Architecture and curated by Executive Director Priscilla Fraser, presents PROCESSIONAL @ the Chiesa di Santa Maria della Pieta on the Grand Canal near the Danielli Palace Hotel. Williamson collaborated with Professor Greg Walter from the UNC School of the Arts on a 3 movement work of original music specifically written for the Processional exhibtion. Williamson was also awarded the "Prize for Creativity" by the Pollock Krasner Foundation making him the 3rd artist to receive this particular award. For Processional, Todd Williamson examines the ideas of order and tradition to insinuate the deep uncertainty and uncontrollable political, social, and cultural movements of our time. Both the work and concept generated for this installation will draw directly from the environment in which it will be displayed, Chiesa di Santa Maria Della Pieta, in Venice. Occupying the long, narrow chapel located to the side of the Church, the space invites a meditative, sequential process of reflection. Drawing from the formal proportions, material richness, and dramatic natural light of this special site, the artist has developed a series of works, which encourage contemplation, challenge the perceived order of tradition and ask who are our apostles today? What are their roles? Is the influence of today’s perceived Influencers truly inspirational or dangerously dogmatic? William’s large scale canvases will sweep across the chapel’s walls of brick and crumbling plaster. The artworks will offer a new layer, a current materiality, to the deep patina of aging plaster and brick establishing a deeply rich, and continuous monochromatic palette. 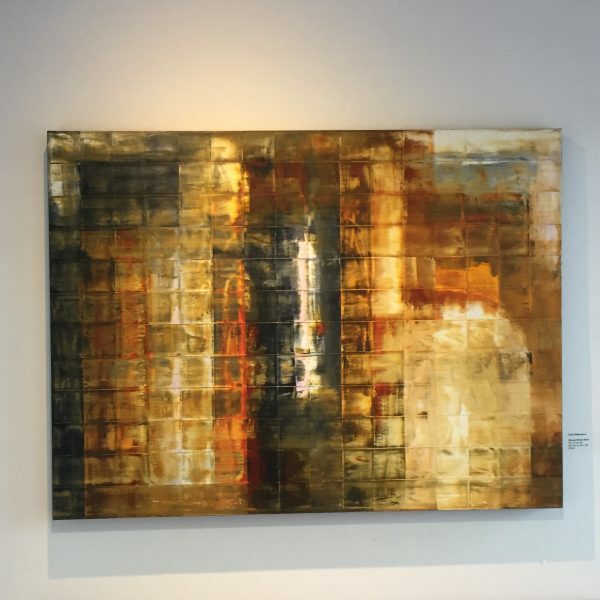 The colors of these new works are connected to what Williamson has termed, “the Modern Apostles and their antithesis”, that is, contemporary influencers and thought-leaders that have the remarkable power to cover, pervade, and completely overwhelm the existing environment. These rare individuals can then both initiate great ethical reform or fragment such ethics to the point of irreparable damage and erasure. While figures have interrupted the establishment through civil, social and technological innovations (Nelson Mandela, Steve Jobs, Elon Musk); others have operated in a totally opposite direction, bringing fractures, distortions, erosion of pre-existing structures, but without any innovative or constructive intent of a new order. "PROCESSIONAL" will travel from the Venice Biennale to the MAC Museum in Singen Germany afterwards. Pollock Krasner "Prize for Creativity"
@ the Santa Maria della Pieta Chapel on the Grand Canal. I received the official letter of congratulations from the Venice Biennale and its been a crazy ride! The idea for the exhibition came up originally in the summer of 2018. I asked Jennifer Chi, a well-respected curator and good friend to write the curatorial statement and began discussing how we could create an exhibition that was exciting and beautiful while also current and impactful. Professor Greg Walter from the UNC School of the Arts is working with me to compose music that reflects the ideas behind the art and to create an auditory experience as you move through the exhibition. The MAK Center of Art & Architecture came on as my presenting sponsor and Priscialla Fraser will be the curator on record for the exhibition. he idea of how a "tweet" could create an international best seller or destroy a company. How a person's wealth could be used to create good for the world or lead everyone to ruin. The idea is still developing as I paint and as the music is created. I have 3 of 8 planned grand-scale paintings for the space while at the same time I am working to fund-raise and deal with my everyday art and its needs! I am working with an important NY art foundation (more details to come!) that will be my major sponsor for the event as I finalize the budget. Its been an arduous journey to get a detailed budget and to plan for a 7-month long exhibition in another country! "PROCESSIONAL" will open May 8th and run through November 2019 @ the Pieta Church on the Grand Canal a few hundreds yards from the Grand Canal and the Arsenale. Our country is at the most precarious point in time and history. The decisions to be made will not only change our lives, but it will also affect the entire world. It is an urgent time and art has always been the best medium to convey the Message of the People. Like in the Russian Revolution, the Russian Avant-garde was born. The works of Kazimir Malevich, Aleksandra Ekster, Vladimir Tatlin, Wassily Kandinsky, David Burliuk and many more gave silenced a voice. Victory Over the Sun was a theatrical work that incorporated the visual and the performing arts. It was their Reality TV. Fortunately, I was able to see a reconstruction of this brilliant political and artistic performance shown at our own Bing Theater at LACMA. It was so moving and powerful in a more tranquil time in our country. However, today it would be more poignant. So that was then and now is a crisis now! I am so pleased that we have artists like Todd Williamson, who has conscientiousness, intellect and talent to awaken us from our sleep – there is a war going on people. Let the dictates of society behold the messages that this artist delivers. Question yourselves about what you are doing to make a difference. Do you think nothing will change? Are you secure in your life and your world? Well, you better partake of what is going on in our country or you only have yourself to blame. Look at Williamson’s message uncalculated on his canvases. Go tohttp://www.artemerge.org – The Disillusionment of Truth and read the words of the artist and click on the link to explore and reflect as you see each one of his works of art. May they be a beacon or a remembrance of a time in which we lived and too few responded. It is like the Gandi and the Dali Lama are holding hands, praying that we bring harmony and peace to the world. Maybe you think your vote on one proposition or one candidate does not matter. Well, if we all have that attitude nothing matters. If we engage ourselves like Williamson everything matters. He has left the questioning up to you. Enjoy the art and take action in however you see fit, Now is the time to activate and respond in kind. Lets make a difference and continue the change from within. This starts in our own homes and moves to DC. The world will be a reflection of our inner strengths and morality. Yes, one poetic painting can say a lot and mean so much more. Contemporary art is an easy thing to hate. All the meaningless hype, the identikit openings in cities that blur into one long, banal, Beck’s beer fuelled anxiety dream from which there is no escape. The seemingly endless proliferation of biennials—the biennialization or banalization of the world. One begins to think that everything aspires to resemble the opening of a Frieze art fair and every culture wants its own cheeky Damien or spunky Tracey. Glamour, celebrity, business, and radiant superficiality blend together to give each location the patina of globality with just a frisson of local color. People talk excitedly of what’s hot and what’s selling for millions. Capricious and seemingly tyrannical übercurators wander around quickly with their assistants talking on cell phones. The sharp eyes of eager young gallerists track them like prey, waiting for the moment to pounce. Everyone is either on the make or wants to be on the make. Contemporary art has become a high-end, global culture mall, which requires very little previous literacy and where the routine flatness of the gossip allows you to get up to speed very quickly. People with the right connections or serious amounts of money or sheer stubborn persistence or who are prepared to do anything can quickly gain access to what has the appearance of a cultural experience. God, it’s awful isn’t it? And I haven’t even mentioned how this art system is fed by the seemingly endless proliferation of art schools, M.F.A. programs, and the progressive inflation of graduate degrees, where Ph.D.s in fine art are scattered like confetti. It is difficult not to be cynical about contemporary art. Maybe the whole category of the “contemporary” needs much more reflection. Maybe it needs replacing. When does the contemporary cease to be contemporary and become something past? When did the modern become the contemporary? Will the contemporary one day become modern or will there, in the future, be museums of postmodern art: MOPMAs? Why not call contemporary “present art” or “actual art” or “potential art,” or, better, “actually potential art” (APA)? At least it sounds more Aristotelian. But, then again, why use temporal categories at all? Why not use spatial terms instead? Some have spoken of visual art as spatial art, which is an attractive idea. Whichever way one approaches it, however, the categories need to be seriously rethought through research that is historiographical, institutional, and anthropological. The problem with contemporary art is that we all think we know what it means and we don’t. As a consequence, the discourse that surrounds it is drastically impoverished. But despite such confusions of reference and the horrors of the contemporary art business model—or perhaps even because of it—I want to defend contemporary art, up to a point. It is simply a fact that contemporary art has become the central placeholder for the articulation of cultural meanings—good, bad, or indifferent. I am middle-aged enough to remember when literature, especially the novel, played this role and when cultural gatekeepers were literary critics, or social critics, often from literary backgrounds. That world is gone. The novel has become a quaint, emotively life-changing, and utterly marginal phenomenon. The heroic critics of the past are no more. I watched this change happen slowly when I still lived in England in the sensation-soaked 1990s and recall, as a kind of cultural marker, the opening of Tate Modern in 2000 and immensely long lines queuing up to see a vast spider by Louise Bourgeois in the Turbine Hall. It was clear that something had shifted in the culture. Even more, the contemporary artist has become the aspirational paradigm of the new worker: creative, unconventional, flexible, nomadic, creating value, and endlessly travelling. In a post-Fordist work paradigm defined by immaterial labor, artists are the perfect entrepreneurs and incarnate the new faux bohemianization of the workplace. Being a contemporary artist looks like a lot of fun, like being a rock star in the 1970s, except you get to live a little longer. Perversely perhaps, what I admire about much contemporary art is the negotiation of its own relentless commodification, the consciousness of its capture by the circuits of casino capitalism. To work in a university is to be aware that money is changing hands, but the money is hidden and professors like myself can still give themselves the illusion that they are clean-handed, authentic educators and not money-laundering knowledge pimps. But artists do not have that luxury, which gives them a certain honest edginess and less chronic institutional dependency than academics. The question is whether art is simply a symptom of the rampant capitalization of the mind or whether it can still engage a critical space of distance and even resistance. This might not be the autonomy of Greenbergian modernism, but is closer to what Liam Gillick calls “semi-autonomy.” Not fully free, but not fully compromised either. A space between critical abstraction and commodification. One thinks here of a project like “No Ghost Just a Shell,” by Philippe Parreno and Pierre Huyghe from the early 2000s, which flaunts its commodified character with a manga character bought for 46,000 yen, but manages to subvert it as well. Maybe there is a certain dialectical inversion at work here, where the compromised character of contemporary art also occasionally permits the opposite to come into being. One might also note the odd way in which the vocabulary of contemporary art, in particular those tendencies that one associates with the brand “relational aesthetics,” with its emphasis on collaboration, participation, and community, has crept into contemporary forms of radical politics. A friend of mine worked on a book about OWS that is prefaced by an aerial, two-dimensional plan of Zuccotti Park. Looking at it, I thought “Jesus, this looks like an installation.” More specifically, it looks like the kinds of wonderful transient structures built by Thomas Hirschhorn, complete with a kitchen, a media space, a library, a discussion space, and so on. So, if there is a rampant commodification of contemporary art, on the one hand, then there is also the bleeding of art practice into novel forms of sociality and politics on the other. What might “contemporary” art be doing that it is not doing? I have a modest and uncertain proposal to make. Art should not be comfortable. It should be a blow to the back of the neck, as Bruce Nauman says. But what might that mean now? How might that blow be administered? Let me shift briefly here into a more philosophical register. In Kant’s Critique of the Power of Judgment, he makes a passing, but suggestive set of distinctions between the beautiful, the sublime, and the monstrous. The beautiful is the free play of the imagination and understanding, when everything seems to hang together, rather like driving a humming-engined expensive German car through the California desert. The sublime is what is refractory to the formal harmony of the experience of beauty, something formless, indefinite, and mighty, but still containable within the realm of the aesthetic. For Kant, the sublime is “the almost-too-much,” and is distinguished from the monstrous understood as “the absolutely-too-much.” That which is monstrous defeats our capacity for conceptual comprehension. Kant simply asserts that the monstrous has no place in the realm of aesthetics. The great aesthetic danger is the moment when the tamed terror of sublimity—the Alps or Mount Snowden for the English Romantics—might tip over into the monstrous. Indeed, in the founding text of philosophical aesthetics,Poetics, Aristotle makes an analogous gesture when he makes a distinction between the fearful (to phoberon), which has a legitimate place within tragedy, and the monstrous (to teratodes), which has no place at all. To put this in other terms, we might say that a certain dominant strain in the history of philosophical aesthetics might be seen as trying to contain a dimension of experience that we might call the uncontainable. This is the dimension of experience that Nietzsche names the Dionysian, Hölderlin calls the monstrous, Bataille calls the formless, and Lacan calls the real. But what might art be when it exceeds the relative comfort of the almost-too-much of the sublime or the fearful and moves toward the absolutely-too-much of the monstrous? What happens when the uncontainable can’t be contained? When art bears at its core something unbearable? At this point, art becomes anti-art and we experience discomfort—the Naumanian blow to the back of the neck. I would argue that this is what has been happening for the past century or so in various arts and media as a way of dealing with our presentiment of the unbearable pressure of reality, however we want to capture that experience—the shocking trauma of the First World War, poetry after Auschwitz is barbarism, or whatever—has been the experimentation with what we might call an art of the monstrous. Examples proliferate here, from Artaud’s Theater of Cruelty, to Bataille’s holy disgust, to Hermann Nitsch’s blood orgies and the theatre of Heiner Müller, even through to that most jaded and overworked of academic tropes: the abject. It seems to me that if we look back at much of what is most radical and interesting in the art of the last century, we can see that we are no longer dealing with the sublime or indeed with art as the possibility of aesthetic sublimation, but with an art of de-sublimation that attempts to adumbrate the monstrous, the uncontainable, the unreconciled, that which is unbearable in our experience of reality. Here is my modest proposal: beyond endless video montages and the cold mannerist obsessionality of the taste for appropriation and reenactment that has become hegemonic in the art world, the heart of any artistic response to the present should perhaps be the cultivation of the monstrous and its concomitant affect, namely disgust. Disgust here can be thought of as the visceral register of a monstrosity that can no longer be excluded from the realm of the aesthetic, as it was for Aristotle and Kant, but should be its arrhythmic heart, its hot and volatile core. It is important to keep in mind the link to aesthetic judgments of taste orgustus, which gives us the “gust” in dis-gust, the ill wind in the soft-flapping sails of revulsion. Dis-gust is an aesthetic judgement of dis-taste. What I am calling for, then, is a new art of monstrosity which is able to occupy a certain semi-autonomous distance from the circuits of capture and commodification. Art now must fix its stare unblinkingly at the monstrous, the unbearable, the unreconciled, and the insanely troubling. The disgust that we feel might not simply repulse or repel us. It might also wake us up. When talking about the violence of paint, it’s nothing to do with the violence of war. It’s to do with an attempt to remake the violence of reality. We nearly always live through screens—a screened existence. And I sometimes think, when people say my work looks violent, that I have been able to clear away one or two of the veils or screens. Existence seems to me ever more screened and distanced. This is the risk of a shallow shadow-world whose ideological pancake patina is an empty empathy for a suffering that we do nothing to stop and everything to abet in our passivity, dispersal, and narcissism. None of us is free of this. Maybe art, in its essential violence, can tear away one or two of these screens. Maybe then we’d begin to see. We do not see as we are seen because we are wrapped in a screen. Art might unwrap us a little through its violence. But what is it that disgusts us? Ay, there’s the rub. I remember giving a Halloween sermon called “How to Become God” in the Cabinet space in Brooklyn a couple of years back. I was dressed as a priest and my friend Aaron was clad as a kind of Satanic elf. We sat on 15-foot-high chairs while on a wall behind us a film of Nitsch’s blood orgies played in gory and graphic detail. Punters happily sipped their cocktails and smiled benignly as they gazed at the spectacle. There was even some playful heckling. The problem with disgust is that it is a moving limit. What outrages one generation—Bacon, say—becomes slothful banality to the next. The problem here is that art, which is meant to enable or produce some kind of experience of the real in our pushing back against it, might finally be a protection against that experience and end up as a kind of decoration. Perhaps, then, art has to become the enemy of aesthetic experience. In which case, we should become the enemies of art in order to reclaim it. Here anti-art becomes true art in a constant war of position with the degeneration of art’s critical potential into the lethean waters of the contemporary. Michael Genovese opened his 3rd solo show at Moran Bondaroff on La Cienega on Saturday night. I have to admit I was very impressed with these intricately painted works and the perfection that Genovese achieved. This show is a far cry from his "cracks in the wall" show Lines and Cracks and Zebras and Horses" at Ow Wow Gallery in 2013. In the small back gallery were small paintings, really small! Lucian Smith had a series of "small" oil on linen paintings, 5 to be exact. About the size of a sheet of paper and about that interesting. From a distance they could be read as waves on the beach but up close this effect was lost. Forbes featured Smith twice in its 2013 and 2014 list of 30 under 30 in their "Art & Style" list and the New York Times and Vogue Magazine both named him the art world Wunderkind. I didnt get either of those in this small show but hey I did enjoy the proximity to the bar!